Below you’ll find the canonical reference for Memorial Day email planning. From email examples to specific promotional strategies, we’ve included everything you need to ace your campaign. 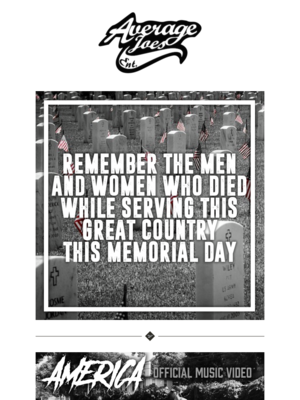 Here's the email to put together when your boss comes to you at 4 p.m. on a Friday afternoon and asks you to come up with another Memorial Day message. 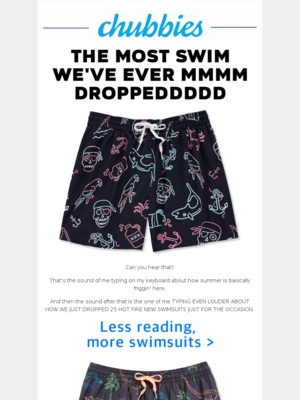 Modcloth sent this email midafternoon on Memorial Day, probably aiming to capture interest from revelers who were either just getting up and checking their phones or taking a break from the weekend-long festivities. Chubbies meets the challenge of standing out in the inbox with an eye-catching subject line (“I sincerely regret not opening this email.”) and preview text (“Signed, Future You”). Once your customers open your email, are you going to bore them with a basic offer? You'd be better off following Chubbies' lead, creating a simple but clever design on a topic — swim trunks — that will be on your customers' minds as summer arrives. We picked this email because it's a simple and stark reminder of what the day is all about. This one stands out from the pack because it uses color effectively and sparingly in a black-and-white photo. It also mentions both men and women in its tribute. Lots of Memorial Day photos focus only on service members who happen to be men. Including women is a gesture of respect ... and recognizes the reality of today's military. When you plan a Memorial Day Weekend promotion, get out in front of all the other big discounters. Gap sent this email on the Monday before the holiday weekend, when competing retailers relied more on generic messages or sent nothing. The subject line prods shoppers to act (“Redeem your code now! You've been given early Memorial Day deals”), the email copy highlights the deep discounts, and the offer code (“PARTY”) is easy to remember. 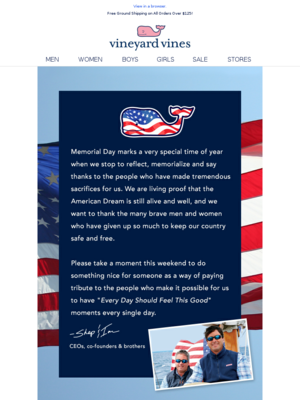 Start planning your Memorial Day email strategy with great examples. 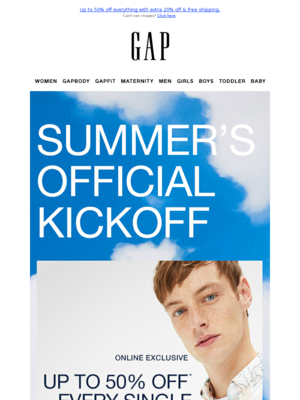 This Gap email calendar is based on Gap, who sent 3 emails for Memorial Day in 2018. This ROKA email calendar is based on ROKA, who sent 7 emails for Memorial Day in 2018. This Pottery Barn email calendar is based on Pottery Barn, who sent 7 emails for Memorial Day in 2018. 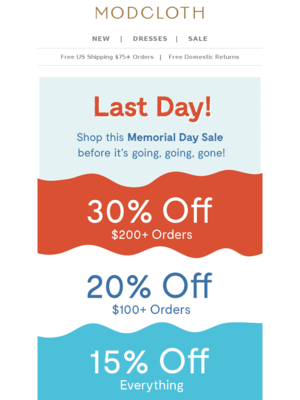 Will you simply send one email on Memorial Day or will you send a few emails leading up to it, including a “last chance” email once the event is over? Based on 4246 emails mentioning "memorial day" in the subject line. Discover the most popular types of promotions used for Memorial Day. Understand how steep a discount companies offer for Memorial Day. You can toggle between Dollars Off and Percent Off. 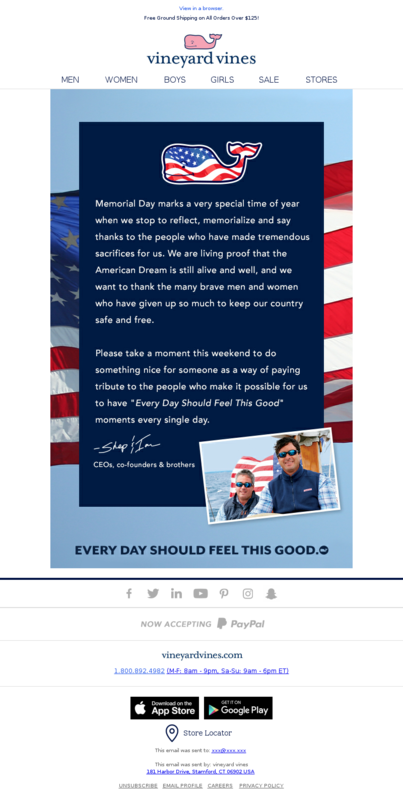 Ace your Memorial Day email content with these ready-to-implement strategies. Enjoy! Memorial Day has a theme for everybody: American patriotism, the kickoff to summer, hanging out with family and friends, taking a long weekend away from work. One of these is bound to resonate with your customers and drive sales. Here are four strategies you can use to plan your email program. Some brands devote an entire email to this theme. Others refer to it symbolically by using American flag motifs and red-white-blue color choices in fonts, hero-image products and background images. Note: Don’t confuse Memorial Day — where we honor people of service who have died in wars on foreign soil — with Veterans Day (which is more about supporting our veterans and thanking them for their service). The long Memorial Day weekend is the official kickoff to summer, even in places where it’s summer all year long. Fun in the sun, travel and family figure into this theme. Of course, your competition is also thinking alone the same lines. Make sure you come up with a stand-out email that your brand manager is going to love, too. That’s what Memorial Day means for many Americans. Your emails can evoke togetherness, party prep and everything else that goes with getting together for an extended holiday weekend. If you have time, test whether your customers respond differently to Memorial Day promotions. Try percentage off versus a monetary discount. Does one drive more sales or higher average orders than the other?